Giancarlo Cattini established the INDUSTRIA CHIMICA GENERAL in the mid-seventies in Modena. The company’s growth is founded on the product quality, the self financing, the reinvestment of the profit into the company and the absolute reliability towards the customers and the suppliers. Because of the increase of orders and turnover in the eighties involves in the company his wife Gianna Ferrari and the brother Marco Cattini, with the entry in the company of the son Alberto Cattini on 2005, the whole actual share structure. 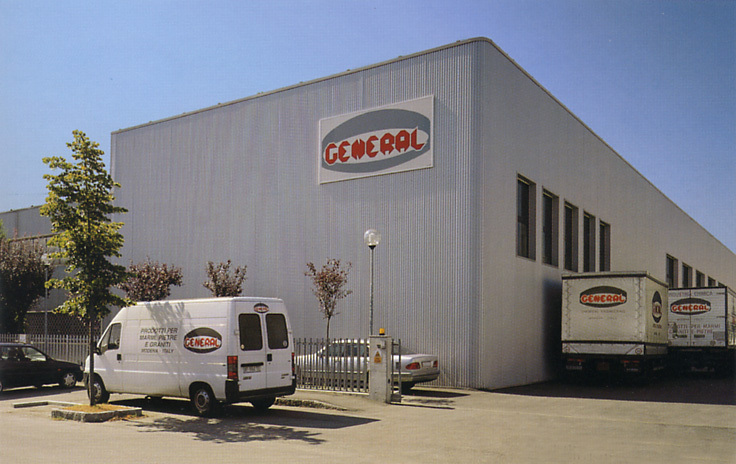 In 1990 GENERAL moves into the new factory and thanks to the further buildings extension in 1997 the production capacity is increased fivefold. In 2003 starts the production of the new factory build on 15000 square meters ground of Bondeno (Ferrara) with a technologically advanced line for the production of cement powder adhesives line laying floor and wall and afterwards a production line for resinoid diamond abrasives. The constant evolutions and transformations of the production and managerial process of the company are the base on which has been obtained the certification of the Quality System according to the UNI EN ISO 9001:2008 during the years 2005.